..... Click the link for more information. , class Magnoliopsida, order Apiales, family Apiaceae (Umbelliferae). Lots of vitamin C and iron. High chlorophyll content works to absorb odors, making it great for bad breath and after eating garlic. Great for eating raw, juicing, blending or tea. Helps oxygen metabolism, cleans blood, dissolves sticky deposits in veins, maintains elasticity of blood vessels, helps remove moderately sized kidney stones and gallstones, stimulates bowel, treats deafness and ear infections, the sexual system, and stimulates adrenals. Parsley tea or juice strengthens teeth, fights gum and mouth infections, makes a face lotion, and settles stomach after a meal. Tea also used to treat treat urinary infections, fluid retention, congestion from flu and colds, lessen asthma attacks, kidney and liver obstructions, anemia, antiseptic, lowers blood pressure, antitumor, liver stimulant, treats hypoglycemia, diuretic, good fiber laxative, encourages milk production for nursing mothers. Grow near roses, asparagus and other garden plants to keep bugs way. Petroselinum crispum. A biennial herb of European origin belonging to the order Umbellales; grown for its edible foliage. A Pascal extension for construction of parse trees, by Barber of Summit Software. It features Iterators. ["PARSLEY: A New Compiler-Compiler", in Software Development Tools, Techniques and Alternatives, Arlington VA, Jul 1983, pp.232-241]. In addition, the company said Gagan Singh will replace Parsley as chief investment officer and continue with his current responsibilities and Randall C.
Parsley is seeking damages against Quinn for breach of contract, among other things. 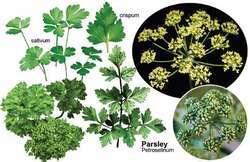 4 APIGENIN, a compound found in parsley, could have strong anti-cancer properties, a study from the University of Missouri discovered. 8m units of Parsley Energy, LLC (together with a corresponding number of shares of the company's class B common stock). Owner Fiona Campbell-Smith, from Oban, Argyll, says Parsley has been a wanderer since he was a kitten. As you'll learn in this article, parsley is much more than a garnish: It's a compellingly nutritious, healing food that should become a part of your regular diet. INGREDIENTS Pappardelle with mushrooms 400g pappardelle 200g (sliced) button mushrooms 120g (sliced) oyster mushrooms 120g (cut in wedges) shitake mushrooms 5g (soaked in 50ml of warm water) dried porcini 1 large clove garlic (finely chopped) 100ml white wine 150ml vegetable stock 2 tablespoons parsley (chopped) 100g butter 1 tablespoon olive oil Parmesan Salt, pepper INGREDIENTS Pappardelle with mushrooms 400g pappardelle 200g (sliced) button mushrooms 120g (sliced) oyster mushrooms 120g (cut in wedges) shitake mushrooms 5g (soaked in 50ml of warm water) dried porcini 1 large clove garlic (finely chopped) 100ml white wine 150ml vegetable stock 2 tablespoons parsley (chopped) 100g butter 1 tablespoon olive oil Parmesan Salt, pepper METHOD 1. Do you always leave that curly sprig of parsley on the side of your plate? Mention of parsley traces back to the first century A. INGREDIENTS 800g potatoes, old, raw, peeled and cut into chunks 400g carrots, old, raw, peeled and sliced 600g gammon steak, raw, (4 x 150g) trimmed of fat 4 tablespoons milk, skimmed 60g cheese, soft, low fat (less than 5% fat) 100g cabbage, finely shredded parsley sauce: 300ml milk, skimmed 2 tablespoons (level) cornflour, fresh parsley 3 tablespoons parsley, fresh 1 pinch salt, and freshly ground black pepper METHOD Cook the potatoes in lightly salted boiling water until tender, about 20 minutes. NO KITCHEN should be without a good supply of parsley, a multipurpose herb packed with healthy properties that can be grown in a pot on the windowsill all year round.